One of the most effective conversion boosters is writing personal (but professional) product descriptions for the items that you offer. Manufacturer descriptions are often so chocked with technical terminology, and gaudy self-promotion, that buyers simply ignore them. People want to know that real people are on the other end of a website, and writing unique product descriptions is one of the best ways to show that you are real, and that you care. Describe the basic features that people are interested in. Explain what you like about the product. Explain why the product is better than others. Give appropriate alternatives to the product. 1.) Describe the basic features that people are interested in. This should be simple. Most products have a few features that give a buyer a good idea of how the product stacks up against others and generally will give a customer an idea if they are looking at something they want. Avoid overly technical terminology unless your market is ‘definitely‘ going to understand what you are talking about. However, avoid being overly general as you don’t want to insult your audience’s intelligence about the product. This is a premium custom-made desktop computer, powered by a Pentium Core 2 Duo processor, 2 Gigabytes of RAM, and a 100 Gigabyte hard drive. This is Nike’s newest set of irons. These are made from hardened carbon steel, offer a large sweet-spot for forgiveness, and a graphite shaft for a soft feel. The set includes the 3 – PW, and is ideal for beginning to intermediate golfers. 2.) Explain what you like about the product. As someone who is selling a product, you should easily be able to tell a customer what you personally like about what they are interested in. You probably have better ability to compare a product with other similar products than a normal shopper, and customers do care about your opinion on what you sell. Note: It is very important to give an honest opinion of the product, and if you use strong marketing words, your integrity will be in serious question. If the product has some minor concerns, outline them, but explain why it is still a great product. Grokdotcom recently posted a great article that can be applied to situations where products have negative traits. We really liked the touch screen function of the Alpine IVA-D310 DVD car stereo receiver. It is easy to use, and works without fault. The LCD is ultra-bright, and this receiver costs about half the price of comparable models. This is an excellent DVD car stereo for the budget conscience shopper. 3.) Explain why this product is better than others. There must be a reason that a customer would purchase Product A instead of Product B. This is where you outline the benefits of this product compared to others. You can include statistics, links to research, or just an opinion, although factual information is far more appropriate for outlining benefits. Again, be careful using highly technical terms unless your customers will understand them. In an independent test, the North Face Windwall 2 Jacket had the best rain and wind performance rating of any jacket in it’s class. The Creative Zen V Plus mp3 player offers the largest storage and most features of any mp3 player under $300. 4.) 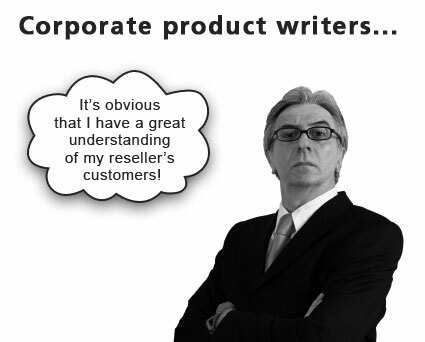 Explain how the buyer can benefit from this product. What is this product going to do for your customer. This is fundamental to all marketing, how can your customer benefit by spending their money on this product. The Samsung SyncMaster 226BW LCD monitor will triple your productivity from the moment you plug it in! 5.) Give appropriate alternatives to this product. This is not up-selling, but rather offering suitable alternatives based on price, or features, or design. Maybe this product is very expensive, but you have another similar but less featured product that’s cheaper. Let them know that if it is too expensive, or has too many features, or is too ugly, there are other options. An alternative to the Trek Pilot 5.2 racing bike is the Trek 1000(linked text). It offers comparable performance for the non-racer, but the cost is more than $1000 less than the Pilot 5.2. Use we and not I, unless your business is selling as yourself. ‘I’, does not give the perception of a trust-able, solid business. Don’t put too much information on your basic product page. Keep the page, or at least above the fold, clean and organized, and make sure the ‘add to cart’ button is at the top. Link to technical specs, and detailed descriptions either on separate pages, or lower down the same page. Avoid spelling and grammatical errors at all cost. You’ll probably find a dozen or so in this article, but your product descriptions can have none! Check, re-check, and have someone else repeat. Nothing is more unprofessional than typos and grammatical errors. Don’t ever lie! If you can’t honestly address one of these steps, then it’s better to skip it than to fake it. Learn your customers. The better you know your audience, the better you can use vocabulary and ideas to appeal to your customers. Test your changes. The only way you know if the product descriptions make any difference is to test. Ideally, a split A-B test is the best way to measure results over time, but any sort of comparative testing can be greatly beneficial. Once your personalized description is complete, you do still need to give people additional options such as technical specs, detailed descriptions, additional features, upgrades etc. Some people will be looking for the details, but most people don’t need them right off the bat. Personally, I have never, not seen, a benefit from well planned personalized product descriptions. It gives your website a personality, something that is rarely seen in an internet full of similar sites. Agreed on this one. I once spent three hours looking for ski jackets online because none of the websites would use descriptions beyond what the manufacturer gave them. Sometimes, the descriptions were even less helpful than the stock description. All I was looking for was the different features of each jacket and the recommended temperatures for each one. Using non-stock descriptions is also SEO gold because it allows you to avoid the duplicate content penalty. Brief and clear. Valuable tips. Just want to add that if i am on the site of the seller, i would also much appreciate customers’ opinions on the goods.